This week's fun find is an iPhone app created by a friend of ours. She's an artist with a wildly successful natural perfumery business - and she happens to adore cats. Combine that with a wicked sense of humor and what do you get? The Cat Translator. 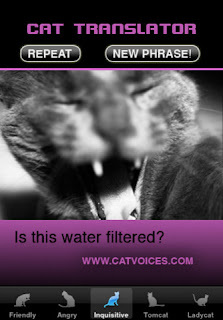 The Cat Translator covers many feline interaction situations, such as "Is this water filtered?" (something Allie, as an H2O connoisseur, is always concerned about). And at only 99¢, this Fun Find is a bargain! 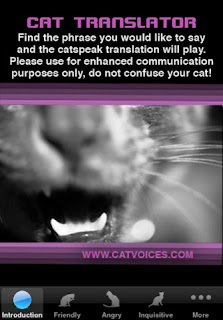 To run the Cat Translator, you need an iPhone or iPod Touch. To purchase the app, go to CatVoices.com and click the "Available in the App Store" button - or click this link here. no iphone we just have a dumb phone but have a fabulous Friday. nO Iphone here either - Not even a you phone! he he - sounds like a nice app tho for those that can use it. Arrrgh...We don't have an Iphone! Oh my, I might have to check that one out!!! I may have to check that one. I wonder if we can get a sample of how it sounds before we buy? rats, wish we had it to show you! They're divided into categories: friendly, irritated, happy, curious, angry - stuff like that. That's her cat, Jack, modeling the app logo. I am getting this as soon as my iPhone arrives!! It will be my first app! I love it! What will they think of next? Ha ha ha! That's ALMOST enough to send the Human out to buy a smart phone. She only has a dumb phone. It makes phone calls. That's it. But on the other hand, she says it only costs her $8 a month, so she thinks it's smart enough, MOL. MUST check this one out!!! I'm always up for a silly cat app! ....Katie here. WHY oh WHY must you encourage her?